Tui Ora is the largest community-based health and social services provider in Taranaki. Established in 1998, our organisation has evolved and now incorporates more than 35 services and programmes. They are available to everyone within our geographical boundaries, with many accessed by non-Māori. Our services are strengthened by membership of the Te Kawau Mārō alliance, the single contract for Māori health services in Taranaki. This coalition which includes South Taranaki iwi Ngā Ruāhine, Ngāti Ruanui along with the Taranaki District Health Board, is working together to lift health outcomes for our local people. We are governed by a structure that represents the eight iwi in Taranaki. As a capacity building organisation we support The Wheelhouse, a single point of contact for Taranaki trusts, clubs, societies and groups to help them grow stronger and be more sustainable. 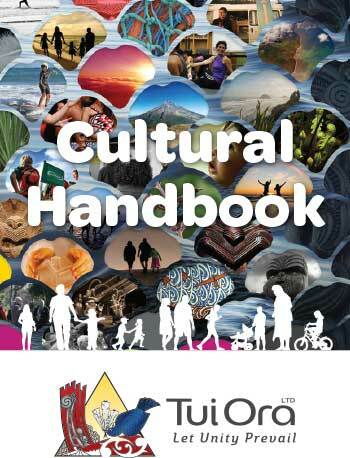 To see our cultural handbook, updated in August 2017, click here or on the image below.